Who has never had the opportunity, wherever he or she is on our planet, to hear about Nelson Mandela? In the early 2000s, far from being old enough to fully understand the scope of the former South African president’s actions (indeed barely old enough to understand what a president is), it was already impossible to surprise most children by humming his name, undoubtedly heard several times on the radio in the famous Simple Minds title “Mandela Day”. Later, as teenagers, these same children will discover in more detail and not without emotion this man who symbolizes South Africa. Whether at school, watching a documentary or reading a book, everyone has heard his name at least once. For my part, there is no doubt that I am one of these children, although I was particularly interested in the fate of this remarkable man after watching the famous film “Invictus”, named after Nelson Mandela’s favourite poem, which helped him through the darkest hours of his life and which he later passed on to the Springboks national team in 1995 inspiring them to win the Rugby World Cup. In short, there are many cultural references stem from this great man and on 18 July, International Nelson Mandela Day commemorates his contribution to the promotion of a genuine culture of peace. This year has a very special significance as it also marks the one-hundredth anniversary of his birth. Madiba, as he is nicknamed in South Africa out of respect, affection and tribal tradition, dedicated 67 years of his life to equality and cultural diversity. As a tribute to this long-term work, this day is celebrated by devoting 67 minutes of one’s own time to the well-being of the communities in which we live. 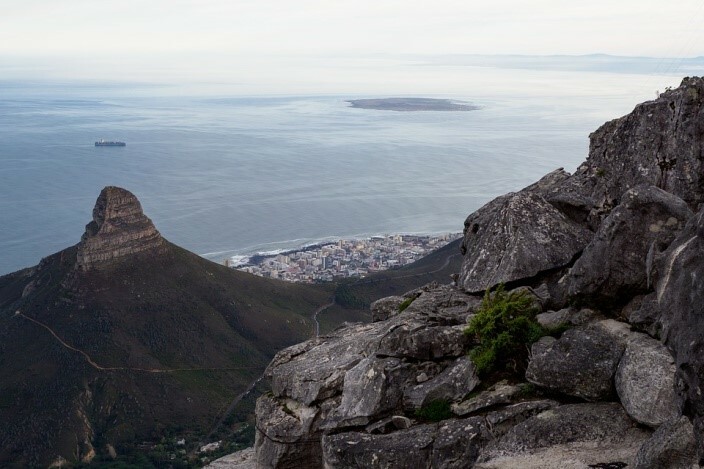 Today, through this article, we wanted to mark the occasion in our own way, by exploring the link that exists between South African tourism and this emblematic figure who has largely contributed to position South Africa on the global stage. Internationally sanctioned because of its separatist development policy until the early 1990s, South Africa experienced a remarkable tourism boom after the release of Nelson Mandela, who drew all international media attention to the country, helping to reinstate South Africa as an international tourist destination. South Africa has an impressive tourist capital, with many assets including superb national parks and very varied landscapes, alternating between wide open plains, beautiful mountain ranges and long coastlines, and ranging from sub-tropical to arid, and Mediterranean climates. People come from far and wide not only to explore the rich landscapes but also to discover the land of man that has become a model for the world. Did you know that the structuring of tourism in South Africa is the initiative of Nelson Mandela? After he took over the presidency in 1994, Mr. Mandela proposed the creation of a white paper on tourism in 1996, setting out the strengths and weaknesses of the territory from a tourism point of view and creating the “South African Tourism”, the tourism marketing arm of the South African government in charge of the country’s international promotion. Moreover, it has the added value of integrating tourism into the country’s various development plans. For example, the “Poverty Relief Fund”, a programme to combat poverty, offers tourist guide training or training related to tourist safety. In short, tourism was, for Nelson Mandela, a vector of economic and social development as part of a strategic national reunification. 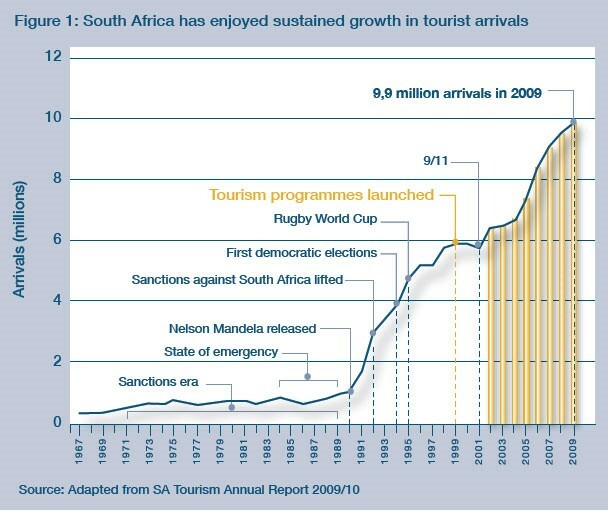 Above: Evolution of tourist attendance in South Africa from 1960 to 2010. The sudden increase of the curve corresponds to the release of Nelson Mandela in early 1990. Although they vary greatly depending on the origin of the visitor, the reasons for visiting South Africa often include a cultural aspect, at least for half a day. This mainly revolves around what is referred to as memory tourism consists of, which highlights the historical heritage of a place. In the case of South Africa, Nelson Mandela is an integral part of this heritage. We follow in Mandela’s footsteps, in the country where Rolihlahla, the troublemaker, was born and raised. 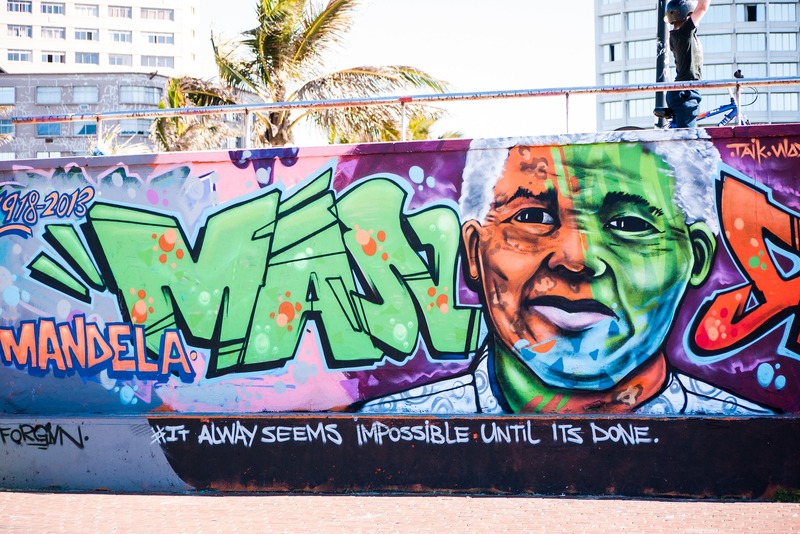 In this sense, South Africa offers many attractions that you can take advantage of to learn a little more about the difficult history of this country and the lifetime struggle of Nelson Mandela. Museums, circuits, historical sites… There is something for everyone. Can you guess which of these cultural activities is the most visited? The Nobel Peace Prize rewards “the personality or community that has contributed the most or the best to bringing peoples together and spreading progress for peace”. In total, 4 South Africans received this prestigious award. 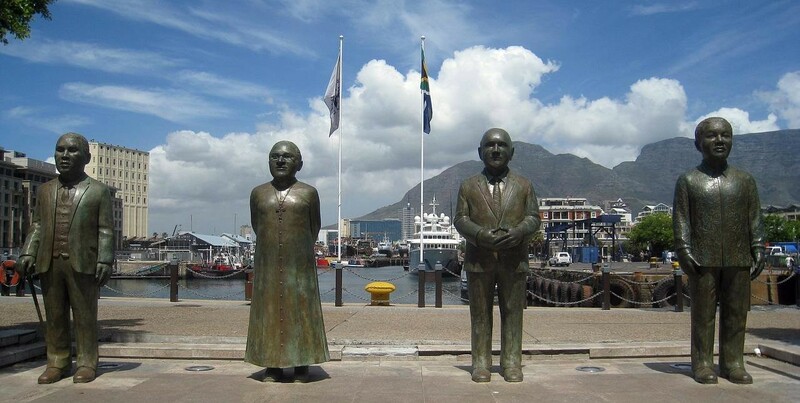 They are all gathered in this photo at Nobel square in Cape Town (From left to right: Albert John Luthuli, Desmond Tutu, Frederik De Klerk, and Nelson Mandela). Very few countries can claim that one of their major tourist attractions is a prison. Except perhaps the famous Alcatraz prison in the United States, which sheltered celebrities such as Al Capone and Frank Morris who escaped from it in 1962 and was never found. The Robben Island prison off Cape Town is undoubtedly the most famous in the world. This small island served successively as a prison, quarantine zone, psychiatric centre and even fortification during the Second World War before becoming a prison again. But, it is not so much its successive roles that has made this prison famous. It is because it “welcomed” Nelson Mandela after being taken as a political prisoner and sentenced to serve his sentence on the island. It was during this period that his fame gained international status. In 2017 alone, the island welcomed 336,000 visitors from around the world, looking to discover this famous place of detention of the “father of South African democracy”. During apartheid (which translates directly as apart-ness), the government isolated all the country’s political prisoners on Robben Island, with the aim of cutting them off from the rest of the population and thereby breaking all political opposition. Once released, Nelson Mandela himself explained that this was the biggest mistake on the part of the government of the day, because it allowed prisoners representing different political ideologies to be in permanent contact with each other and able to exchange their different opinions until finding a consensus on many subjects. That is why we can sometimes hear about this prison referred to as “Mandela University”! View from Table Mountain of Robben Island. The most visited cultural attraction in the country, welcoming more than 300 000 visitors every year. A visit to Robben Island is a great opportunity to add a fascinating cultural dimension to your stay in Cape Town! Learn more about this period of South African history by immersing yourself in the skin of a prisoner on this island and get a glimpse what it was like for a day. Daily shuttle departures take place at the V&A Waterfront in Green Point, which is a hugely popular destination for visitors to the city. It is a very lively area with many restaurants, shops, and museums. So for a beautiful day well filled, we suggest you spend a few hours here before heading for the boat to take you to the island! However, we suggest that you book your tickets directly online to avoid any disappointment on the day of your visit. To save time, remember that your passport number will be requested at the time of booking.